If you want to achieve lasting weight loss you need to transform your eating and exercise habits. Your body today is the sum total of your eating and exercise habits. Every habit - good or bad – is the result of many small decisions compounded over time. You can create good habits just as you may have created bad habits in the past by using these simple tricks. 1. Change how you see yourself. If you think of yourself as an overweight person, your chances of making the changes needed to lose weight are greatly reduced. Identify yourself as being a slim person now. You may be holding extra weight at the moment, but you are a slim person who is temporarily holding extra weight. 2. Adopt the habits of a slim person. Slim people are generally not slim because of good luck, birth order or genes. They are slim because they have adopted healthy habits. They do things differently than the rest. To be a slim person, you must adopt the habits of a slim person. 3. Don't rely on motivation alone. Motivation comes and goes. Whether it is healthy or unhealthy, a habit is something you do without having to consciously think about it. People who succeed at weight loss turn healthy eating and regular exercise into habits. 4. Set a new routine and stick to it. Losing weight and keeping it off has everything to do with creating healthier habits. To embed habits into your life, you need to switch up your routines. Basically, if you keep doing what you’ve always done then you are going to keep getting the results you’ve always got. Once you have created new routines and stick with them, those routines eventually turn into habits and become your new lifestyle. Keep in mind that it can take weeks to fully embed a new habit so don’t give up on those new routines too quickly. 5. Create one new habit at a time. When creating habits, you are more likely to succeed when you start small. If you’re trying to exercise more, don’t set out to run for an hour every morning. Rather, commit to starting your day with a 5 minute walk. A 5 minute walk is not that big of a commitment and is something we could probably do with our child/children. You are far more likely to do a 5 minute walk day after day for long enough to embed it into your life as a habit. Once it is successfully embedded as a habit, you can build on it and start adding more minutes to your walk. And besides, on the days you’re doing your 5 minute walk you’ll likely find that once you get going you start to feel better and you keep going beyond that 5 minutes. Once you have built that first habit, move on to the next habit and embed that one into your life. Once that second habit is embedded, move on to the next and so on. Don’t try to overhaul your life in one week. Slow and steady. Too much too soon will cause you to burn out and become discouraged. Don’t wait until you are hungry to decide what to eat. Set aside time one day a week to plan your meals using the In Shape Mummy meal planner. 7. Don’t go shopping hungry. Unhealthy options will be easier to pass by if you have eaten before shopping. Shopping online is ideal as there is no immediate satisfaction to bad decisions you might otherwise be tempted by. Buying that chocolate bar is much less tempting if you know you have to wait 24 hours to get your hands on it! If you know you have trouble controlling yourself around chocolate or other unhealthy foods then don’t keep it in the house. Do yourself a favour by getting a big garbage bin and throwing away any unhealthy foods. Better in the bin than on your hips! Think of it as an investment in your health. 9. Have healthy snacks on standby. When you start to feel hungry, make sure you have a healthy snack close at hand and eat it before hunger really takes hold. 10. Always eat off dishes. Eating straight out of a container or a bag makes portion control difficult and promotes overeating. If you start a meal with less food in front of you, you will likely eat less by the time it’s over. An empty stomach is an invitation to overeat. If you don’t eat breakfast you’ll be starving by lunchtime and more likely to overeat or make bad food choices. Eating with your eyes on the TV, computer or any other distracting screen takes your mind off what and how much you're eating. Not only do you miss out on tasting your food, you're more likely to overeat. 14. Eat small snacks often. Rather than 2 or 3 large meals, you can eat smaller meals and healthy snacks to keep yourself going throughout the day. Listen to your body and be conscious of how certain foods make you feel. Fried food might taste great when you eat it, but how will you feel an hour afterwards? 16. Slow down your eating. It can take 15 minutes from eating until you experience the sensation of fullness. Put down your fork between bites or have a conversation as you eat. By pacing yourself and eating more slowly, you give your stomach a chance to feel full. 17. Pack a lunch box for yourself. Just the way you would for your kids. Packing a healthy lunch allows you to eat before you get too hungry and reduces the risk of having to eat ‘fast food’ because you couldn’t find anything healthier. 18. Eat before you go. If you’re going to a party, eat beforehand so you’re not starving when you arrive. 19. Walk early in the day. Research has shown that people make better food choices if they have exercised, so start your day on the right foot. Also people tend not to feel like eating unhealthy food after a walk as their bodies are in ‘health mode’. 20. Drink before you eat. Not only will drinking a glass of water before you eat help you avoid dehydration, it will also help you feel fuller. Intentionally developing good habits is the most effective way to achieve your goals. 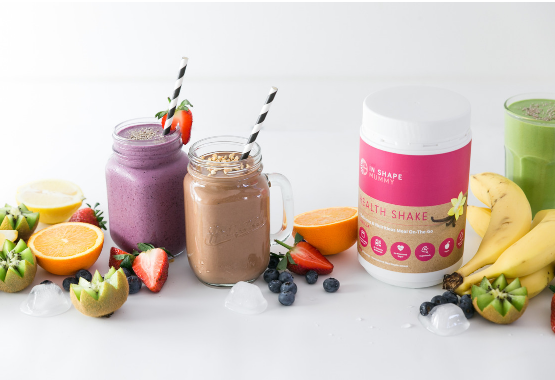 Fast Track Weight Loss with The In Shape Mummy Health Shake. Kick-Start Weight Loss NOW. The New You is Waiting! Copyright 2019 © In Shape Mummy. All rights reserved.